Quicksilver Lionel Messi scored twice as Barcelona beat Getafe 2-0 and qualified 6-0 on aggregate for the King's Cup quarter-finals but they lost Neymar to injury midway through the first half. Messi and Neymar were returning to the starting lineup but the Brazil forward lasted less than 25 minutes as he twisted his ankle turning awkwardly by the touchline and was taken away on a stretcher. 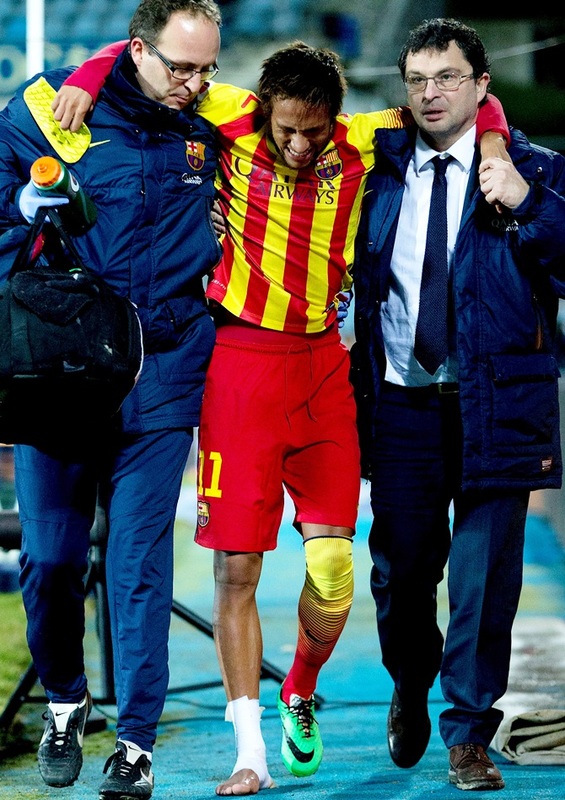 However, after the match Barca coach Gerardo Martino told reporters: "The injury to Neymar isn't as serious as it seemed and he'll be back playing soon." It was Argentina captain Messi's first start since he injured his hamstring last November and the diminutive forward looked sharp in front of goal. After slotting home his first in the run-up to halftime, Messie struck again after the break following a trademark mazy run when he hurdled several challenges and a dive by goalkeeper Jordi Codina before tucking the ball into the net. Midfielder Xavi came on as a second-half substitute for a landmark 700th appearance for Barcelona. 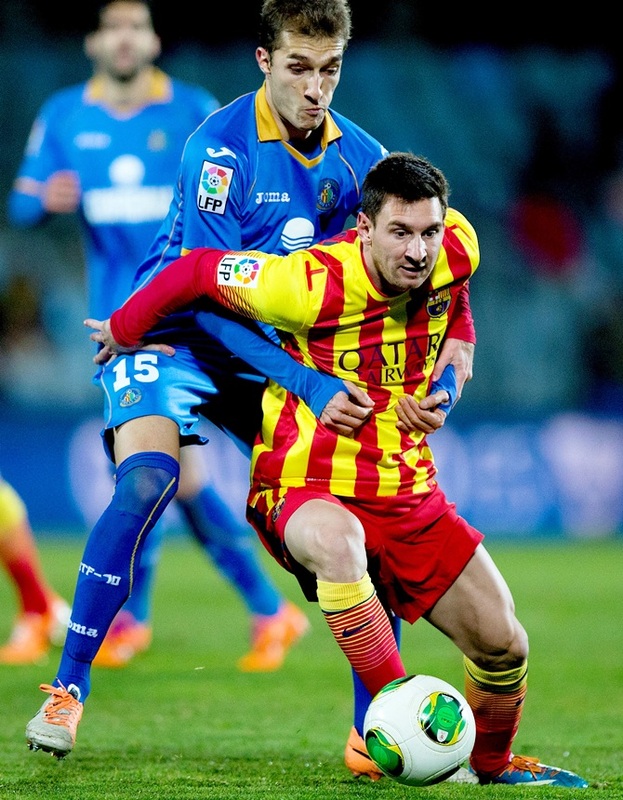 Real Sociedad also progressed with a 1-0 win at Villarreal, having drawn 0-0 in the first leg of their last 16 tie. "We had the right intensity and pressured well. We didn't give Getafe many chances to get into the game and then when Messi scored it appeared as though the tie was over," Martino told a news conference. "Leo showed that he was ready to play 90 minutes. 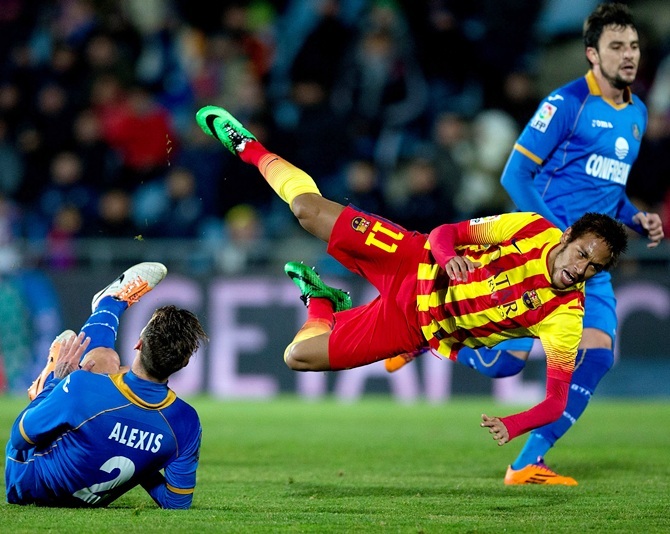 That was the plan for Neymar, (Cristian) Tello and other players to have a full match. Messi was accumulating minutes in previous games and at some point we would decide that he should start. Barca rested several players, including Sergio Busquets and Jordi Alba who were left behind in Catalonia. Messi has been brought back slowly to allow him to build up his hamstring and he started in attack alongside Neymar and Tello. The Argentine fired narrowly wide in the opening minutes having been found by Neymar, and then Tello blazed past the post moments later. At the other end, Juan Rodriguez, given a rare chance in Getafe's lineup, volleyed straight at Barca keeper Victor Valdes from six metres. Alexis was brought on for the injured Neymar and, as Barca stepped up the pressure, Messi gave them the lead when he side-footed a Tello cross into the corner of the net. He added another midway through the second half with a fine run that left several Getafe defenders, and Codina, in his wake before calmly finding the back of the net. PHOTOS: The heat is on at Melbourne Park!